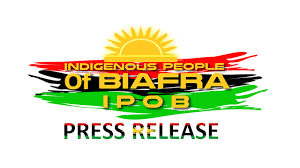 The leadership and family members of the Indigenous People of Biafra (IPOB) worldwide once again condemn the latest episode in the incessant adjournment saga bedeviling all current IPOB cases, especially the high profile treasonable felony case presided over by Justice Binta Nyako at Abuja Federal High Court. This is the second long adjournment in as many months by Binta Nyako's court without any regard for the welfare of those locked up as a result of this case. It does appear that the prosecution in this case has run out of options and are only clutching at the straw of delay tactics as a way of inflicting punishment on innocent Biafrans whose only crime is to identify with those asking for a referendum for Biafra. Which cruel judicial system will sanction the detention of people, who are still regarded by the law as innocent until proven guilty, for upwards of 3 years without trial? The world must know that David Nwawuisi have now spent almost three years in jail for no reason other than the fact that he identified with the cause of Biafra independence championed by IPOB. Benjamin Madubugwu have been locked up in DSS dungeon and Kuje prison for over two years without formal commencement of his trial. Bright Chimezie Ishinwa is still being held by DSS Director General Lawal Daura despite repeated pronouncements by a Federal High Court to release him unconditionally with compensatory payment of 5 Million Naira for illegal detention. Chidiebere Onwudiwe is also locked up for no reason. In total disregard for the rule of law and judicial pronouncements, Bright Chimezie Ishinwa is still languishing in underground DSS detention facility in Abuja. Since the DSS will not obey court order to release Bright Chimezie Ishinwa or attend court to hear the case involving Benjamin Madubugwu, Chidiebere Onwudiwe and David Nwawuisi, why are they still holding them in detention? All men and women of good conscience must ask serious questions regarding the operations of the legal system in Nigeria and how undemocratic it is for a government to throw people with different opinions in jail indefinite without proper trial. In instances where a tortuous legal process have led to a verdict the government is not happy with, they simply ignore the order and continue the illegal detention of a citizen. How is it expected that Bright Chimezie Ishinwa, Benjamin Madubugwu, Chidiebere Onwudiwe and David Nwawuisi will obtain justice when rulings are not obeyed and court sessions are adjourned recklessly without regard for the welfare of the victims of this lopsided judicial system. The onus is on the Chief Justice of the Supreme Court and other well meaning legal luminaries to prevail upon the office of the Attorney General of the Federation (AGF) and DSS to obey court judgements and respect court processes. The idea that a high profile case can be adjourned at the instance of the prosecution, not the court, is an alarming development that speaks I'll of the impartiality of the court. There are other prosecutors in the Ministry of Justice that could have attended court yesterday to handle this matter but instead the case was adjourned without regard for the fundamental rights of those held in prison. We are advising Nigerian Government and her judicial Commission including the DSS that their delay tactics in handling IPOB cases cannot stop or deter Biafrans from legitimately demanding the sovereignty of the nation of Biafra. It stands that the only reason why Binta Nyako's court and many others like it are reluctant to hear these cases but instead prefer adjournment after adjournment is because Nigeria has no evidence that can withstand legal scrutiny before any competent court of law. The best thing for Nigeria to do is to withdraw all cases against IPOB and release all Biafrans in detention because no judge in his right mind will ever convict members of a peaceful organisation without credible evidence.